← What’s the name of that round purple girl from Willy Wonka? Ploughman’s Lunch: Plough as in Dough or as in Plow?? Fairway grocery store is DELICIOUSLY evil. I was seriously walking through the store MOWING DOWN on a very fresh baguette. I got a few *choice* stares from other shoppers. Probably because WHO CAN BE SILENT as they chew fresh bread??? I picked up an apple, some cheeses, a baguette and a six-pack of cider. A glorious lunch, if I do say so myself. In England they call this a Ploughman’s Lunch. Um…how do you pronounce that? I thought it was plow-man’s…but it’s spelled differently than I would think. Should this be plough like dough?? English is haaaaaard. Uh oh. Now I sound like Jim Gaffigan. 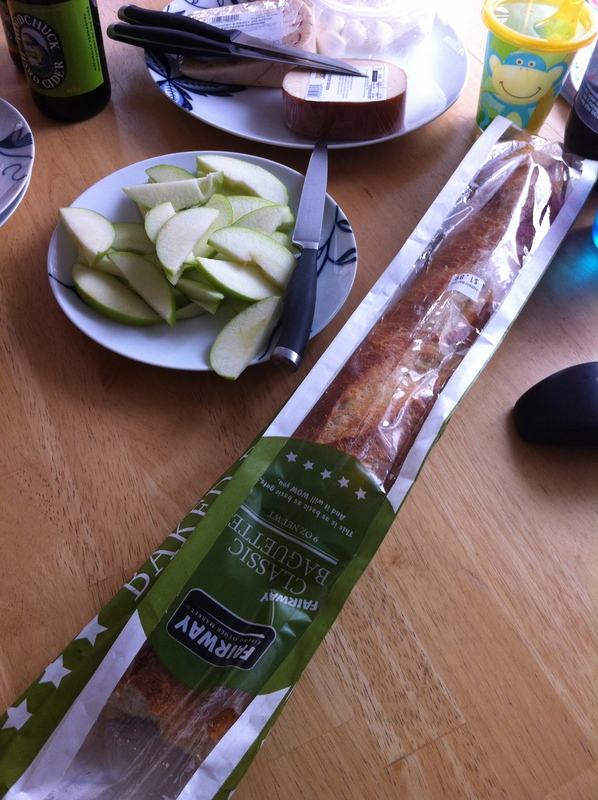 Anyway, so the bread I DIDN’T eat out of the bag at the grocery story was the focal point of our lunch today. It was like a picnic at the kitchen table. I sliced up the apple, I unwrapped all the cheeses and laid them out on a plate, I opened the ciders…simplicity in and of itself. With good quality ingredients like these – who needs complications?? 1 loaf Baguette – the fresher the better! 1 Green Apple – you need a good tart crunchy apple to balance the creaminess and richness of the cheeses. 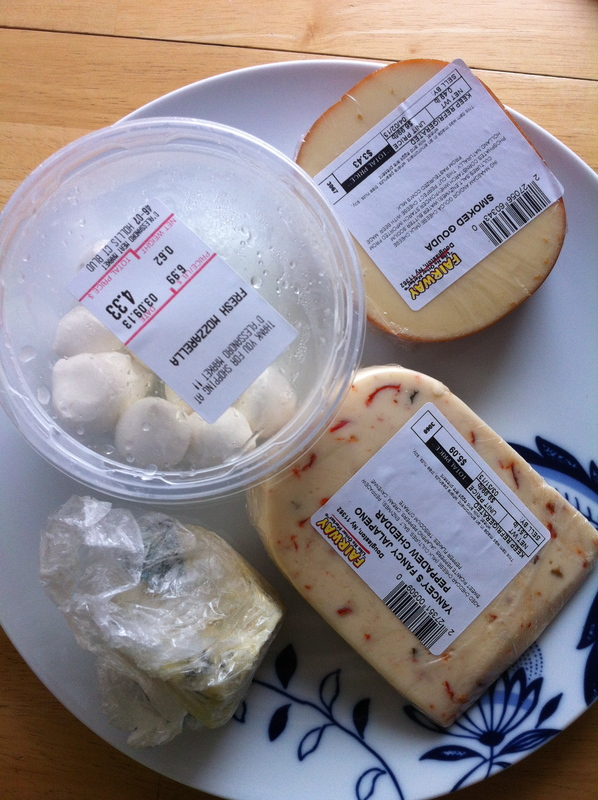 A Variety of Cheeses **Today we had Smoked Gouda, Mozzarella Balls, Blue Cheese (I think it was a domestic version of roquefort), and a Peppadew Pepper embedded Cheddar. 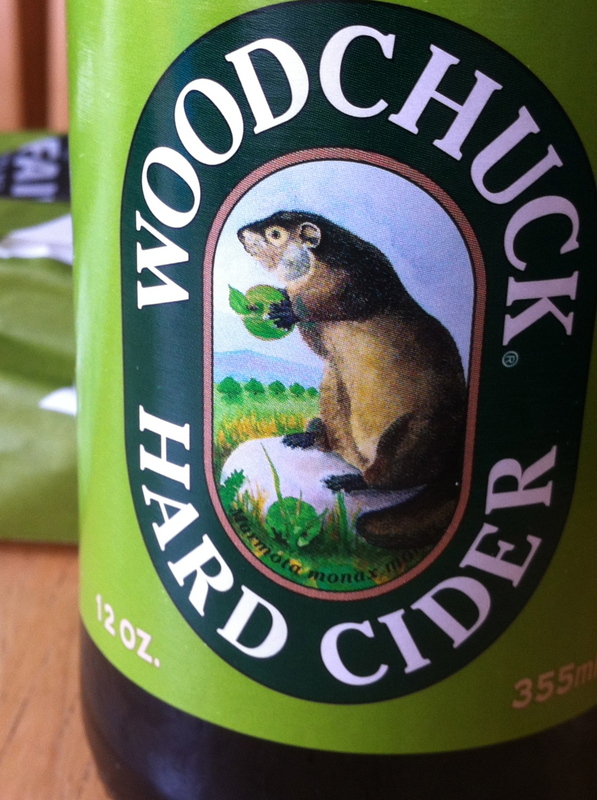 Beer or Cider **We had Woodchuck Cider. Good Chocolate for dessert **We had a bar of Vanilla Smoke from Mast Brothers Chocolates in Brooklyn. 3- Clear off the kitchen table. 4- Shovel deliciousness into your mouth and make ooooooh-ing noises as you chew. 5- Try to allow your husband to eat some of the food as well. 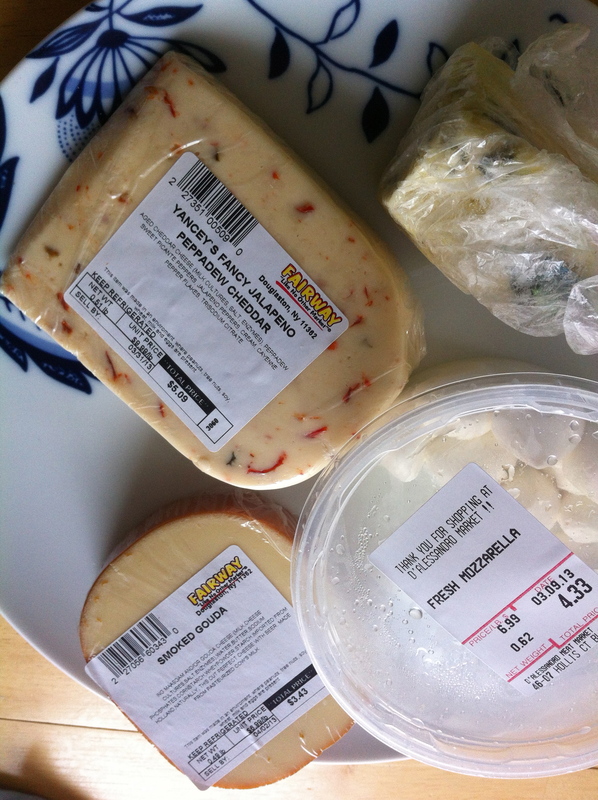 Incorporate more cheeses and ciders into my life. Oh, and fresh bread. Fresh bread is sooooooooo goooooooood.